"So God created mankind in his own image..."
Actually, He did nothing of the kind: we created God in ours. Or at least, the patriarchy did, hence the big beard and not infrequent genocidal strops. 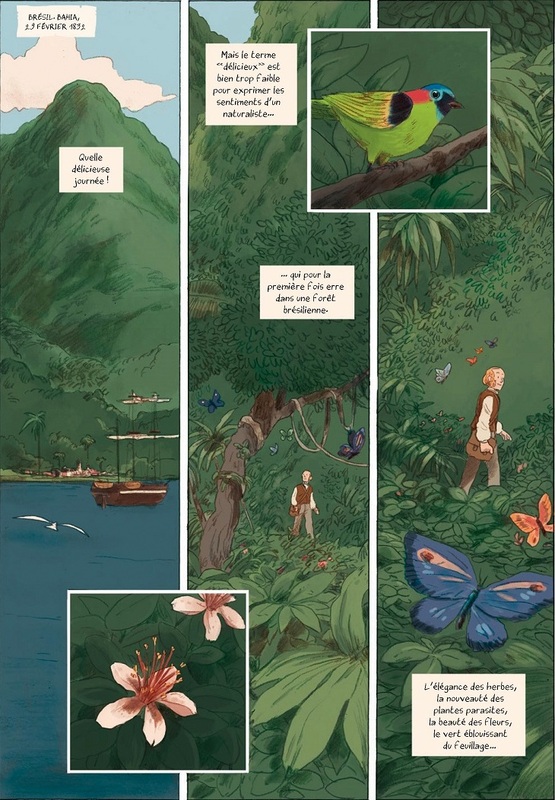 There are several points to this which are all too pertinent to Charles Darwin, his discoveries, his revolutionary, evolutionary extrapolations (the origin of our species etc), and to this gorgeous graphic novel from the creators of AUDUBON which follows the tracks of his treks around the world from 1831 to 1836, focussing on South America and its surrounding seas. It was, if you like, the original five-year mission to seek out new life and new civilisations (before we set about extinguishing them) whilst digging through ancient geological strata, thence discovering some very old life (which we also extinguished on arrival, albeit 16,000 years earlier when Homo Sapiens first settled in America) while challenging some entrenched Christian presuppositions about time. 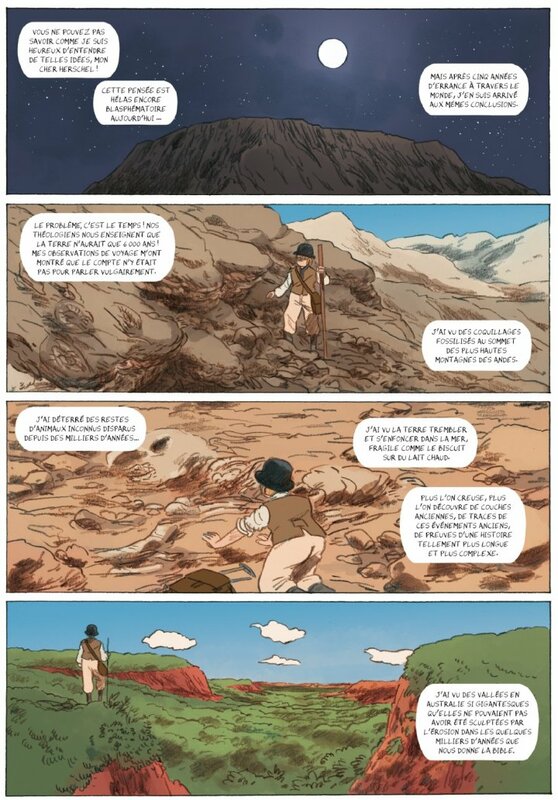 The sermon on Genesis is delivered early on in the graphic novel - almost as soon as The Beagle has set sail - to impress upon us the almost universal doctrine still prevailing 3 centuries into the Scientific Revolution that the world was created in 7 days, just a comparative couple of fortnights ago. What Darwin and others like Lyell (geologist), Wallace (naturalist) and Hershel (astronomer) were on the cusp of pronouncing based on their empirical evidence was not about to go down well within inward-looking ecclesiastical cloisters and the wider society which they continued to dominate with their blissfully ignorant dogma. 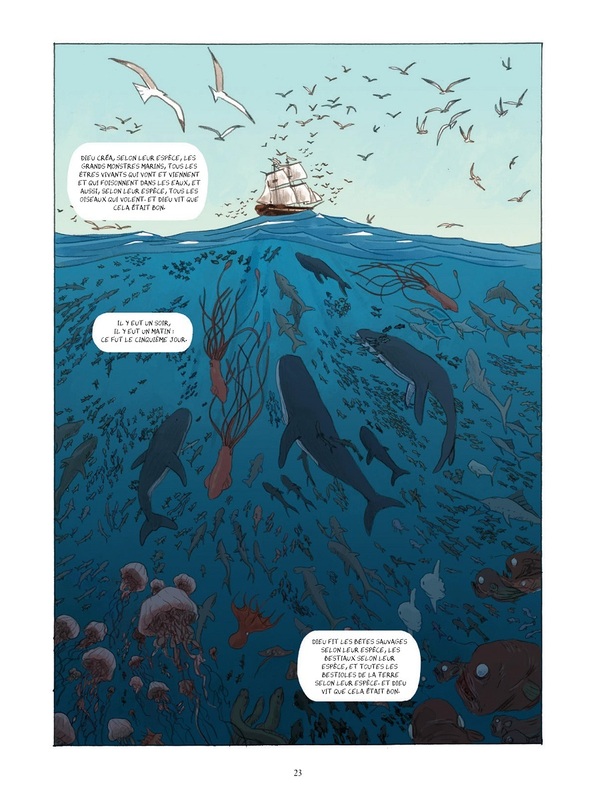 It's not the sermon which drives Darwin to his bunk below deck, shuddering "Agh... Hell on earth! ", but his first experience of seasickness which will rarely pass. Still, the juxtaposition does serve to emphasise that the 22-year-old graduate of Cambridge who'd studied to become an Anglican Parson is going to start preaching something else altogether and become blasted with charges of blasphemy. 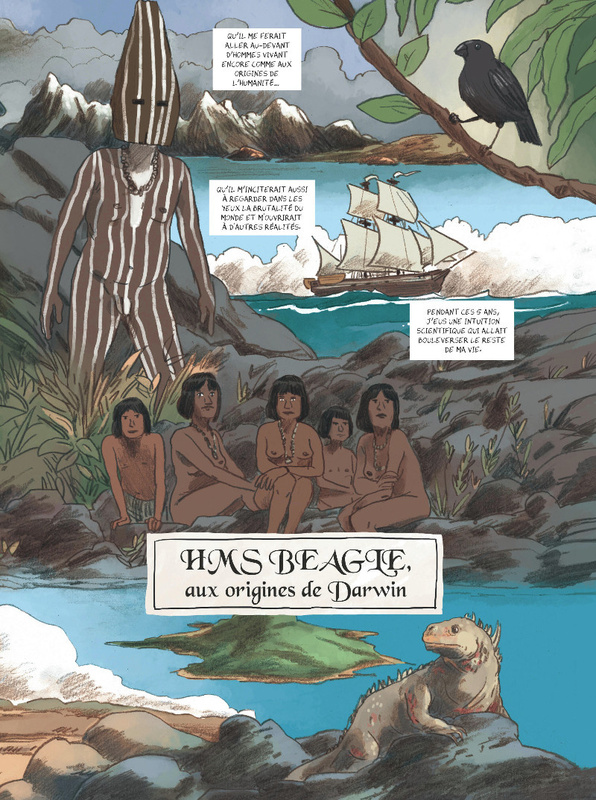 The sense of looming conflict is emphasised visually, first by an illustration of the literary Eden harbouring an array of animals which cleverly conflates continents (African zebras, Indian peacocks), then more forcefully by a striking full page in which Darwin lies, sweatily gritting his teeth with nausea, as a serpent-coiled Eve holds out a rosy-red apple from the Tree of Knowledge while commanding "Respect the word of God, Darwin". If you've an appetite for irony, there's about three courses served up there on a single platter. 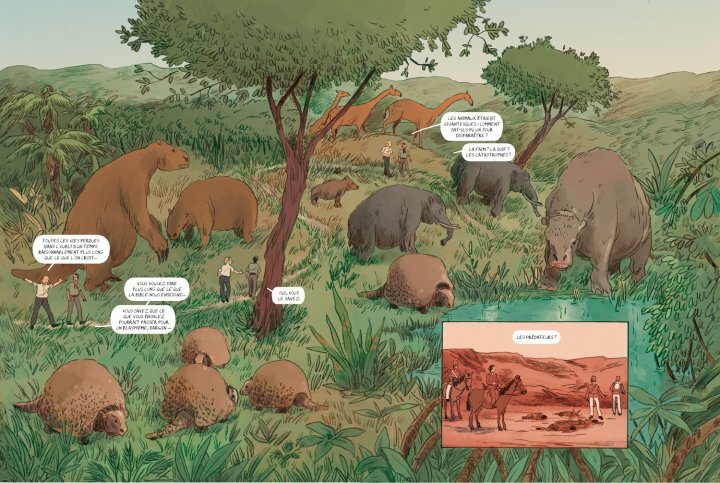 Aaaaaanyway, fast-forward to Argentina, September 1832, and Charles Darwin - still in his early 20s, grey beard to follow without even a hint of post-modernist irony - has unearthed some spectacular fossils: gigantic skulls of big beasts that no one has seen since (*checks Christian calendar*) last Tuesday. 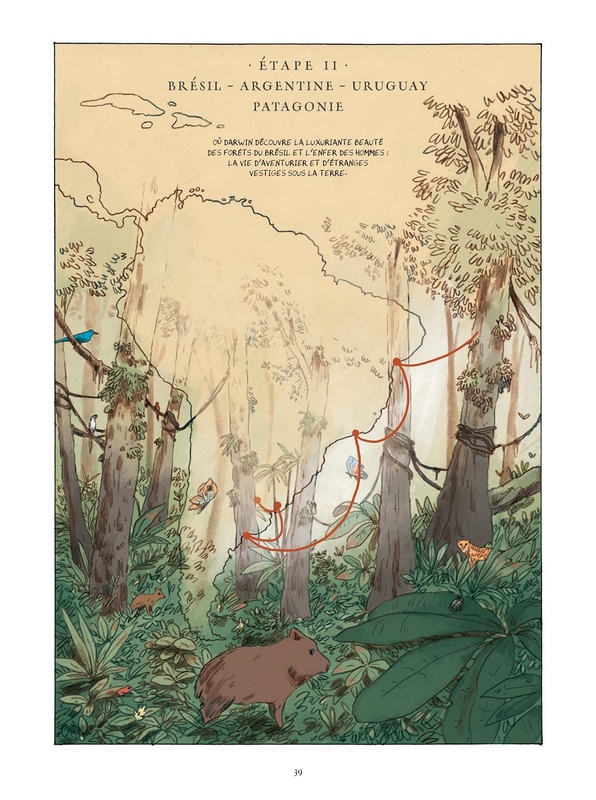 Subsequently we are treated to a delicious double-page spread of Darwin meandering with a Gaucho guide through an unspoiled verdant grass and arboreal landscape, conjuring in their minds all manner of South American Megafauna, like giant ground sloths and glyptodonts. "All these lives lost in the oblivion of a time much longer than we imagined." "You mean longer than The Bible tells us...? You do realise what you're saying could be deemed blasphemy, Darwin? Yes, you do." It's sure starting to dawn on our Darwin. He'll be discussing that very subject with Hershel later. "Those animals were gigantic. How could they have just disappeared one day?" 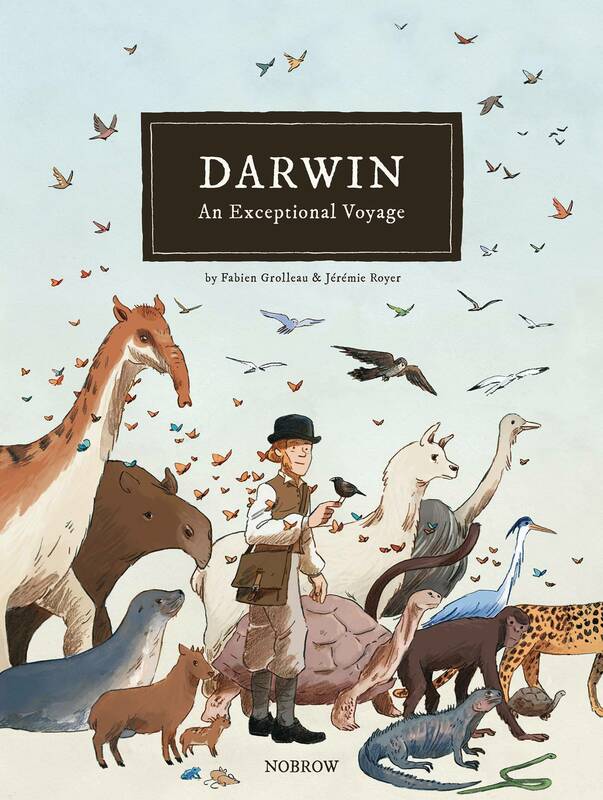 There's a laudable balance throughout of the euphoria Darwin experiences on discovering, collecting and, errr, dissecting so many new animals and plants and seashells before shipping them home, and his dismay - at one meal boiling over into a rage which kept him in conflict with his Captain far longer than the script suggests here (it should be noted that he was the Captain's guest, not his employer) - at the way in which his compatriots mistreated the locals like slaves while in service or, out and about, as savage intruders upon the so-called civilisation which they were exporting. A little after-dinner irony for you, there. 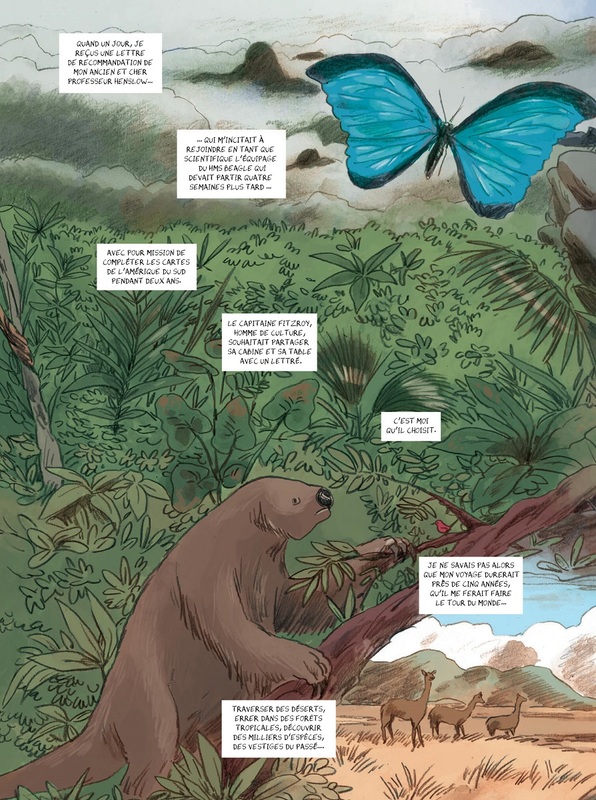 Also admirable is the portrayal of Darwin's inconsistency, for although he was a humanist who believed all the other humans he encountered as essential equal, he was also repelled at times by their dirtiness and diseases and, yes, "savagery". This ambivalence (but also evidence of equality) is brought into especially sharp focus by a substantial, unexpected narrative thread about which I'd previously known nothing: the three individuals which Captain Fitzroy had abducted in chains on a prior visit to Tierra Del Fuego at the southern tip of South America. "He secretly planned to save them from their savagery and convert them to the true faith... He turned those savages into real English gentlefolk, good Protestants. Fuega is now an educated young woman and an incredibly gifted linguist." She'll also prove a very quick learner invaluable to some of Darwin's studies. "Good old Jemmy is a plump little gent: perfumed, coiffed and always impeccably turned out. He never misses one of Reverend Matthews' services. Only York Minster still has his dark Indian stare. Might he have been too old at the time of his capture?" All three are onboard as the Beagle sets sail, the plan being to return them to Tierra Del Fuego with Reverend Matthews and use them in a missionary capacity. Wait until you see how that turns out. It's at this point that I'd refer you to the back of the book, as I did with AUDUBON, in which it's indicated where the graphic novel departs from known historical fact: no one, for example, has a clue about the final fate of these three, but I enjoyed the conjecture, it seemed entirely right not to dismiss their story without one, and it's used to provide much food for imperialist thought. I relished the entire endeavour from start to finish, apart from - I own - the some of the stilted, cliché ridden posh-speak and gruff-speak ("For goodness' sake! This filthy brute broke the poor boy's nose!" "You're in for it! "), but that's by the by. What a work like this must do above all if it's to be a roaring success is to evoke the intoxicated awe that must have been felt by Darwin at the beauty, majesty and sheer variety of everything his eyes encountered for the very first time, and then replicate that beauty and epic majesty. Well, as with AUDUBON, A+++ on all fronts. Great Monarch butterflies migrate right across and up through the page towards us, the depth of perspective increased by the orange light of sunset which falls only on those closest to us. You'll be treated to truly terrifying stormy seas - "KRAAK"ed overhead with black thunder and spiked, white lightning against Vandyke-brown skies - the body of the tempestuous ocean rendered in the richest and deepest slate-grey while multiple cusps, like iced mountain peaks, are granted their power with the striking, counter-intuitive application of a dry-brush effect! 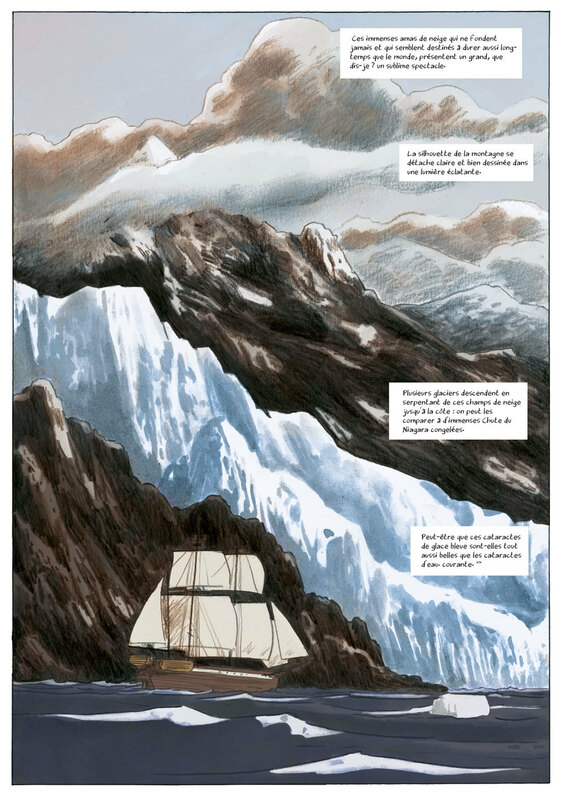 The mountains and glaciers themselves will not disappoint, either, towering over the HMS Beagle, way up into the sky with all the mythical power of Mount Olympus. Through crisp contours and sharply contrasting colours, there's the most remarkable sense of layered distance achieved between the nearest rocky crags, the glaciers behind them, then the final summits beyond, like insanely sized stage slats. The Beagle, on the other hand, is nestled firmly in the same sea that the first crags rear from, entirely at one with its environment. 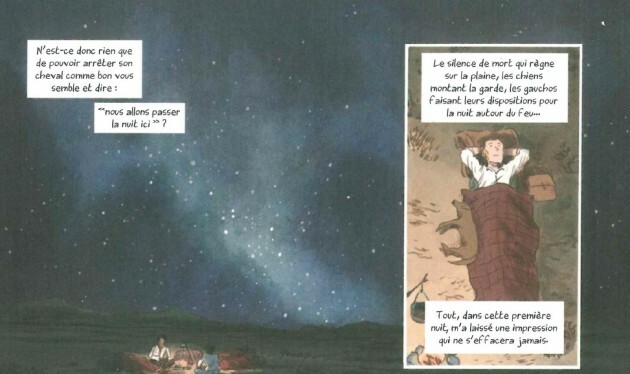 And when Darwin sleeps out in the open air for the first time in Argentina, lying back on looking up at the infinite sky, the constellation of stars cannot help but stir your imagination as it did the explorer's, the naturalist's, the great pioneer of natural selection and human evolution.